Ever since your mom stopped curing your ailments by forcing tablespoons o' Tussin down your throat, you've battled illness by aggressively pretending booze can do the same thing. Bringing that misconception full circle, Tamo's "Take Your Medicine" drink series. Just launched this week, the Seaport Hotel drinkery's celebrating the start of the cold and flu season with a new "medicine-themed" cocktail menu so intensely healing that, had it been created before 1995, it would have made Outbreak seem completely implausible. 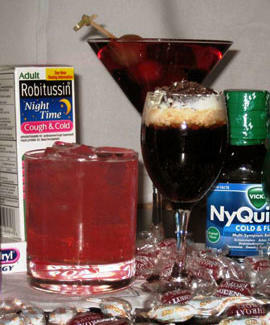 The mending starts with concoctions like the Tamo Flu Shot (a "one-two punch" of Kahlua and Korbel Brandy), and a fusion of Absolut Pear, ginger, lemon, honey, and several "secret" ingredients dubbed Jose's Medicine, which for some reason, Canseco told you was Deca-Durabolin Red Bull. Other curative potables include the Luden's-homage Cherry Cough Drop "reincarnated" with a mix of Stoli Raz, Chambord, and bubbly; and the Grey Goose/Canton ginger/bitters Asian Sniffle Snuffer, also the catchy tagline for a popular S.A.R.S. remedy. If you're still sickeningly sober after all that, there's always the Baby Tylenoltini, an Absolut Pear/ginger/honey/grenadine/pink lemonade mix designed to harken back to "the sweet tartness of Baby Tylenol" -- which, like the now-familiar burny substance your mother used on your aching tooth, will have the desired effect of shutting you the hell up.